I love fall. I never really knew how glorious it could be until I was 22. I had moved from the west coast to the beautiful Natural State just in time to find out how miserable hot and muggy summers were. But after months of profuse glistening things started to cool off and the humidity went away. Leaves began to turn into beautiful, vibrant colors and the smell of fireplaces permeated the evening air. To this day I remember the wonder of that first autumn in Arkansas. The discomfort of a too hot summer changed into a dazzling season that made all the frizzy hair and sticky clothes worth it. Ever since then I’ve associate October with the word CHANGE. 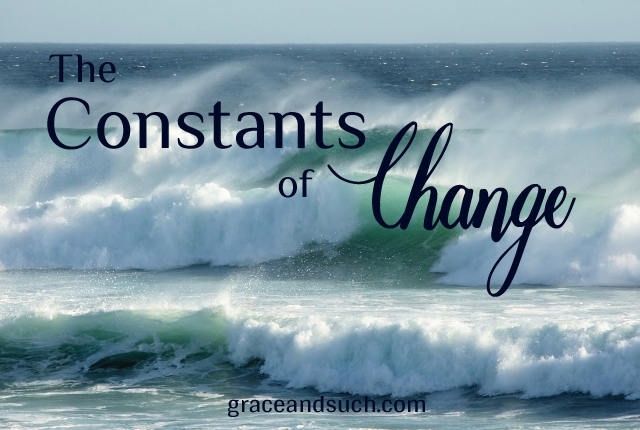 François de la Rochefoucauld, a 17th century French writer, said the only thing constant in life is change. How wise he was. Change is, indeed, inevitable. It can be a pleasant change or it can be unwelcomed. CHANGE can be a little thing ~ We change our minds. We change our clothes. We change our calendars. CHANGE can be a big thing ~ We change our jobs. We change our marital status. We change our residence. Sometimes CHANGE happens to us ~ Our health changes. Our family dynamic changes. Our financial status changes. Sometimes we make the CHANGE ~ Our health changes. Our family dynamic changes. Our financial status changes. I grew up playing in the Pacific Ocean of Southern California. At a young age I learned how to dive into breaking waves, swimming out far enough to catch a ride back to the shore. My friends and I would spend hours doing this and quickly learned the nuances of the fickle water. Sometimes, however, the waves would be bigger than was probably safe and the sets were much too close together. I would dive into one wave only to be pummeled by the wave behind it. I’d finally make it to the surface, filling my lungs with precious air, only to be knocked down again. It might be three or four waves before the set would slow down or I would be knocked back to shore. When you’re under that kind of violent water, roiling around in the churning waves, you don’t know which way is up. It’s kind of like being on a spinning, tilting, turning carnival ride and it’s hard to get your bearings. You have absolutely no control. Sometimes life is like that. I’ve had periods in my life where unwelcomed changes kept coming, one after another just like those waves. My husband got a job 1200 miles away; I was diagnosed with breast cancer; our family lived separated for that whole year; and all the millions of other changes that came with those life altering events. That picture of swirling around under the punishing waves is the perfect image of how I felt during that time. I had no control over anything and sometimes felt as though I was gasping for air. But God. God is constant. He never changes. What a relief to know He’s got this, whatever this is. In those moments I felt I was going under, He lifted me up. When it seemed I was being pummeled, He gave me peace. When I couldn’t get enough air into my lungs, He breathed His promises into me. He doesn’t waiver, He doesn’t surrender, He doesn’t change. And there is a sweet, sweet comfort in that. Change is going to happen, whether big or small or good or bad. Some of it you will manage, some of it you won’t. It’s just a fact of life. When it seems you’re spinning out of control just remember you have a firm rock to cling to, the One who is constant and steadfast. The rock that never changes. Such sweet comfort in knowing that God’s got it … whatever IT IS. Thank you for the reminder, my friend. Under the waves. Thx, Jen, for sharing an accurate view of how unsettling change can be, and how much we need that steady rock! Great analogy and insight! Love this site! Thanks for your encouragement, Denise!